Posted October 10, 2012 by laurielmorrison & filed under Book Reviews, Middle Grade Literature, Posts about pedagogy, Teaching. This year, the theme for fifth and sixth grade English and social studies at my school is China. Last winter and spring, I read several China-related novels as I tried to figure out my book list for sixth grade English. I wanted a range of books that would engage sixth graders, expose them to aspects of Chinese culture, and address relatable themes. I chose Laurence Yep’s The Tiger’s Apprentice for their summer reading book because I thought they’d like the fantasy-style adventure and because it’s the first in a series, so they could pick up the next two if they got hooked. I chose Bound by Donna Jo Napoli for its strong female protagonist and powerful treatment of foot-binding, and I chose American Born Chinese by Gene Luen Yang for the humor, fitting-in themes, and riffs on Chinese folklore. 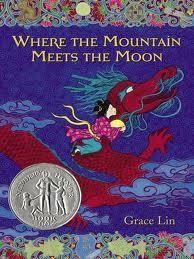 But I almost DIDN’T choose Grace Lin’s Where the Mountain Meets the Moon. I am so happy I came to my senses! I was lucky enough to hear Grace Lin speak (and even eat lunch across the table from her) when she was a visiting writer at Vermont College of Fine Arts a couple of years ago. She was inspiring and amazingly personable, and lots of people whose opinions I trust told me how much they adored Where the Mountain Meets the Moon (plus, there was that shiny Newbery honor sticker on the cover…). So at first, I thought the novel was a shoo-in for my sixth grade book list. And when I started reading it last March, I was captivated. I loved the characters and the descriptions. I was charmed by the blend of magic and everyday life, past and present. But there was this little voice in the back of my head that kept on saying, “It’s too young. Sixth graders will think the print is too big. They might think the illustrations (which are lovely, incidentally) are babyish.” It didn’t help that a colleague of mine told me how much his third grade son had liked the book, or that Scholastic says the book will appeal to grades 3-5 and the reading level is 5.4. It also didn’t help that I felt like I had to make sure the sixth grade curriculum seemed more advanced than the fifth grade one, even though both age groups were focusing on China. When book lists were due, I left Where the Mountain Meets the Moon off mine. It’s a beautiful book, I thought to myself. Perfect if I were teaching fifth grade, probably. I figured I’d just find some Chinese folktales that felt a little more…sophisticated or something, and start the year with those. But as I read other Chinese folktales last spring, I kept thinking about how much more compelling I found the folktale-inspired stories that are integrated throughout the main character Minli’s journey in Where the Mountain Meets the Moon. I reminded myself that a book’s reading level doesn’t determine how rich or complex its story is, and good books have layers of meaning. Sure, younger readers would enjoy Where the Mountain Meets the Moon, but sixth graders would be able to appreciate nuances and make connections that they might have missed at a younger age. I managed to add the book to the sixth grade curriculum a little late, and my students LOVED it. They made great predictions about how the different storylines would come together and thoughtful observations about the varied characters. The book introduced folktales and aspects of Chinese culture in such an engaging way, and there were plenty of opportunities for me to challenge my students as we read (and actually, it wasn’t at all difficult to pull forty unfamiliar vocabulary words from the book for our first vocabulary list). Bottom line: quality of writing trumps “reading level,” and I recommend Where the Mountain Meets the Moon to readers of any age.